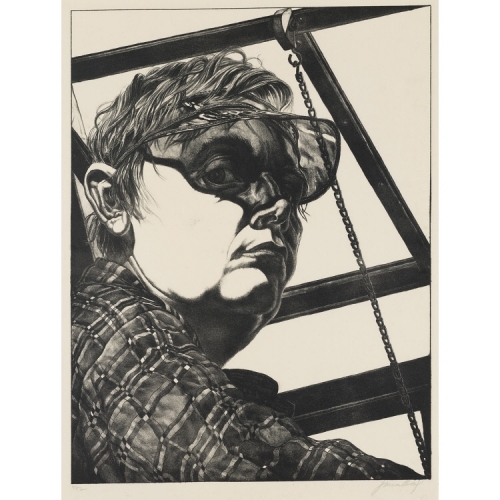 Jack Beal, Self-Portrait, 1974, lithograph on paper, 30 1/8 x 22 3/8 inches, National Portrait Gallery, Smithsonian Institution; the Ruth Bowman and Harry Kahn Twentieth-Century American Self-Portrait Collection. © Estate of Jack Beal. Works by Jack Beal, Enrique Chagoya, and Gregory Gillespie are featured in the National Portrait Gallery's upcoming exhibition Eye to I: Self-Portraits from 1900-Today. Drawing from the National Portrait Gallery’s vast collection of self-portraits, this exhibition explores and thinks critically about how American artists have chosen to portray themselves over the past two centuries. The exhibition will be on view through August 18, 2019.